Ye gads! I’d been sussed! I’d believed no one could see my burning ambition and all the while it had been blazing in flagrante. To my dismay the nick caught on like bushfire and soon everyone was calling me ‘Main Chance’ at the Opera House, permanent crew and itinerant casts included. In my callow yoof, I was mortified and did all I could to live down the evil of being a so-called opportunist. But today, looking back from the lofty height of experience I’d be more blasé. ‘What’s so fearsome about that?’ I’d say, referencing a famous ex-nun about to burst into song to boost her confidence. Doesn’t main-chancer mean I can spot an opportunity and am prepared to gung-ho for it? What an ideal entrepreneurial trait, especially when you’re marketing your own freelance business. Which, of course, I am. Confirmed cave-dweller that I am, I prefer to do all my schmoozing online (okay, so I exaggerate) (only a bit) and forgive me, I’m still learning the ropes. So far NEEDSer is on LinkedIn, Facebook, Hyves, and Twitter, to name a few biggies, and just last night I main-chanced myself onto another two great-looking facilities for business social networking. The other site is part of the Envato network from Australia that was started by the brothers Ta’eed (Collis, Vahid & Cyan) in a living room back in 2006 and now gets upwards of 11 million pageviews a day for the whole network. FreelanceSwitch is a niche site offering all the information and support freelancers need. There are daily postings, chockablog full of useful topics like pricing, finding jobs, dealing with clients and daily productivity. And there are forums for crowdsourcing support and advice plus a resource section filled with knickknacks such as a rates calculator. Again, I’ve only been signed on for a few hours so I can’t vouch for how good the site is. But I’ve had a good first impression of its wealth of freelance booty. That reminds me of a riddle: what’s the hidden link between freelance and booty? You don’t know? Well I’ll tell you. The origin of freelance is ‘free + lance’ (oh do keep up, please). 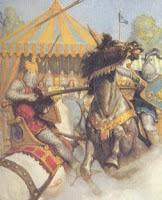 ‘Lance’ comes from, um, ‘lance’, that weapon wielded by knights on horseback, like Sir Lancelot (no relation). ‘Free’ is not what our services ever should be (as some misguided clients seem to think) but comes from ‘freebooter’, which comes from the Dutch vrijbuit ‘booty’ and means a person who pillages and plunders, esp. a pirate. So there you have it. Once we were freebooting warriors, living by the might of our lance and sword. Today we’re freelancers, living by the wit of our mightier pen. All together now: aaaaahhhh! Let me leave you now with a loving testimonial to a contender for the NoBull Prize, one helluva Holstein named Braedale Freelance. Here’s 211 glorious slo-mo seconds of Freelance’s second batch of daughters posing posteriorly to show us their udderly bewitching assets. Shake ya booty and see you next week! Another lovely blog. I am going to check those sites - especially the one relating to improving productivity. I want to get down to working four hours a day and making a living (hope no clients -actual or potential- read this).